The University of Toledo’s Physician Assistant Studies Program has been granted full accreditation in recognition of the high-quality education provided to students in a program that meets or exceeds national standards. The Accreditation Review Commission on Education for the Physician Assistant (ARC-PA) notified the University in a letter sent April 11 that its accreditation has been restored. The program is now on accreditation-continued status, which is in effect until its next review in September 2027. The program had been on accreditation-probation status. “We are pleased with this outcome, and I want to thank the leadership from the College of Medicine and Life Sciences, College of Graduate Studies, and the Provost’s Office for their efforts to develop and implement an action plan focused on enriching the academic experience for the students in our Physician Assistant Studies Program,” UToledo President Sharon L. Gaber said. The Accreditation Review Commission on Education for the Physician Assistant Inc. (ARC-PA) has granted Accreditation-Continued status to The University of Toledo Physician Assistant Program sponsored by The University of Toledo. Accreditation-Continued is an accreditation status granted when a currently accredited program is in compliance with the ARC-PA Standards. The sun rising over Los Angeles March 20 signaled the start of a 50-day adventure for a pair of fourth-year medical students at The University of Toledo who are bicycling more than 3,200 miles across the country. The trip is raising money for UToledo’s Community Care Clinics, a student-run organization that provides free medical care to those with limited or no health insurance. 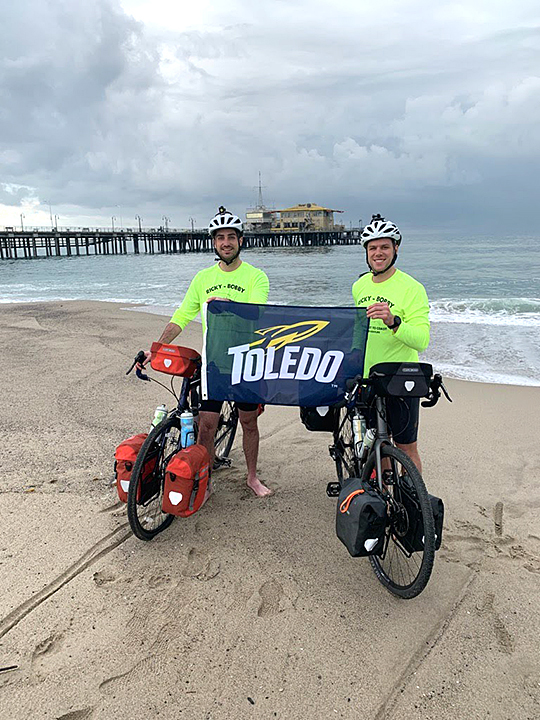 UToledo medical students Ricky Voigt, left, and Bobby Easterling began their cross-country bike trip by dipping their rear tires in the Pacific Ocean in Santa Monica, Calif. They are raising funds for UToledo’s Community Care Clinic. Voigt, an Eagle Scout who will soon embark on an emergency medicine residency at the Mayo Clinic in Rochester, Minn., is joined on the trip by Bobby Easterling, who matched with Ohio State University for his residency in internal medicine. The pair set a goal of raising $3,267 — one dollar for every mile of their journey — but more than $6,000 was pledged to the Community Care Clinics before they rode their first mile. Voigt and Easterling left Toledo just days after Match Day. 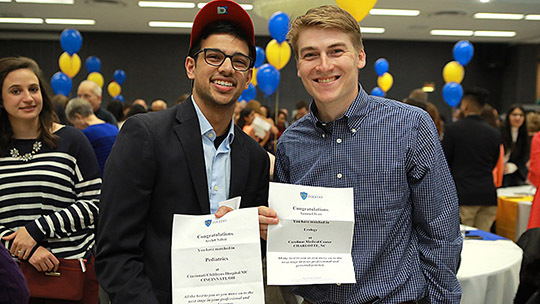 They’ll need to reach the East Coast in time to return to Toledo for their May 10 graduation from the College of Medicine and Life Sciences, giving them just over a month-and-a-half to cross the country. To do that, they’ll need to average about 70 miles a day. They’ve scheduled a handful of rest days in major cities, but they won’t have time to linger much along the route or to have the luxury of packing it in if it rains. In spite of that, they’re both eager to complete this journey. “I think the hardest part is going to be just being on the bike for 45 days. I think physically it’s going to be tough at first, but you kind of get used to it,” Easterling said. Bobby Easterling, left, and Ricky Voigt took a UToledo flag on their 50-day bike ride across the country. 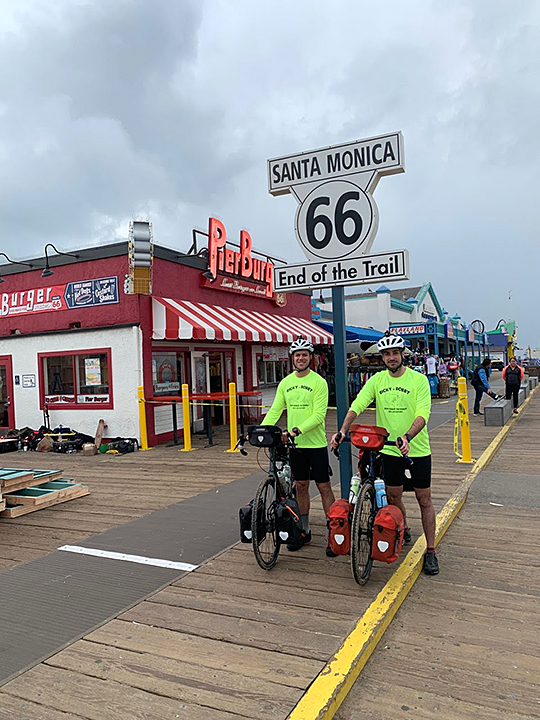 The medical students started their trek in Santa Monica, Calif., and will pedal more than 3,200 miles to the Atlantic Ocean. Avid runners, Easterling and Voigt came up with the idea to do a cross-country bicycle tour after they ran the Flying Pig Marathon together last spring in Cincinnati. One of Voigt’s Scouting friends had previously done a similar trip, and he helped them decide if the trek was feasible in their time frame and develop the initial plan. Easterling, the more serious cyclist of the two, also drew on his experience participating in the 100-mile Pelotonia charity bike ride in Columbus. Since the fall, Voigt and Easterling have been sketching out the route and ramping up their indoor training on stationary cycles. Starting from Los Angeles, they are following the historic U.S. Route 66 to cut across Arizona, New Mexico, Texas, Oklahoma and Missouri into St. Louis. From there, they’ll travel east through Indianapolis, Columbus and Pittsburgh before continuing on through Washington, D.C., and on to the Atlantic Ocean. Each is carrying about 50 pounds of gear on his bike, including camping equipment. The pair elected not to book any accommodations before the trip began to give them some flexibility in where they stop for the night. Easterling and Voigt weren’t heavily involved in the Community Care Clinics during their time at the University, but they each have been impressed by the organization’s reach. Nate Locke, a first-year medical student and director of administration for the Community Care Clinic, said the organization is heavily reliant on donations. The clinics served nearly 5,000 patients last year. Locke said the board is hoping the funds raised by the “Ricky Bobby Bike America for Community Care Clinic” campaign might be enough to cover a larger project, such as adding electronic health records. Voigt will post updates to his Instagram, @therickyvoigt. Donations can be made on the Ricky Bobby Bike America for Community Care Clinic website. A former director of the National Science Foundation who is known worldwide for her work in addressing water quality issues will visit The University of Toledo next week as part of the Jesup Scott Honors College Distinguished Lecture Series. Dr. Rita Colwell was the first scientist to discover cholera can enter a dormant state and lurk in water until conditions are again favorable for it to grow. Her finding opened the door to new research about the link between the natural environment, climate, and the spread of infectious diseases. She is working with the British government on a project to track and better respond to likely cholera outbreaks. • A public presentation of how connections between climate and oceans affect human health on Monday, March 25, at 6 p.m. in Doermann Theatre on Main Campus. • A technical talk about how next-generation DNA sequencing has revolutionized the study of the relationship between microbial communities and how that new knowledge can be used in diagnostics, drug development, public health and water safety Tuesday, March 26, at noon in Radisson Hotel Suite C on Health Science Campus. Both lectures are open to the public, but reservations are requested to the technical talk luncheon; go to the Distinguished Lecture Series website. Much of Colwell’s six decades of research has been dedicated to understanding and preventing cholera outbreaks. Among her many discoveries, she demonstrated how algal blooms, spurred by high nutrient loads and warming ocean waters, increases the population of cholera-carrying zooplankton. Though Lake Erie’s algal blooms raise concerns of microcystin — not cholera — Colwell’s innovative research methods and multidisciplinary way of developing solutions could prove a helpful roadmap to addressing the problem in northwest Ohio. “We believe the kinds of tools she’s developed and the way of thinking about interdisciplinary research-based problem solving will be of interest and value to the people in our region who are dedicated to protecting water quality,” Appel said. 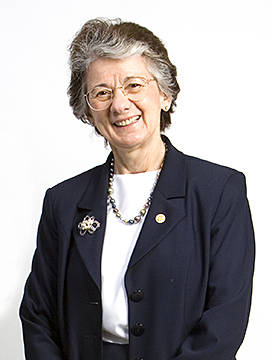 Colwell was the first woman to lead the National Science Foundation, serving as director from 1998 to 2004. She was awarded the National Medal of Science in 2006 and the Stockholm Water Prize in 2010. She has a bachelor’s degree in bacteriology, master’s degree in genetics and doctorate in oceanography. She holds distinguished professorships at both the University of Maryland at College Park and Johns Hopkins University Bloomberg School of Public Health. 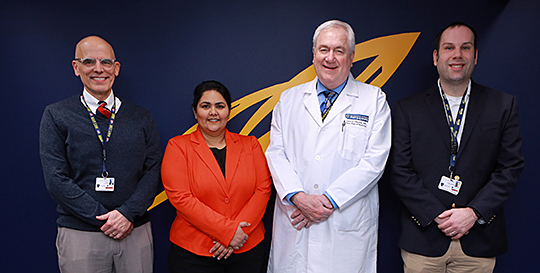 More than 150 fourth-year medical students at The University of Toledo will learn on Friday, March 15, where they will carry out their residencies on the way to becoming attending physicians. The annual Match Day event is a highly anticipated ceremony for graduating medical students across the country. 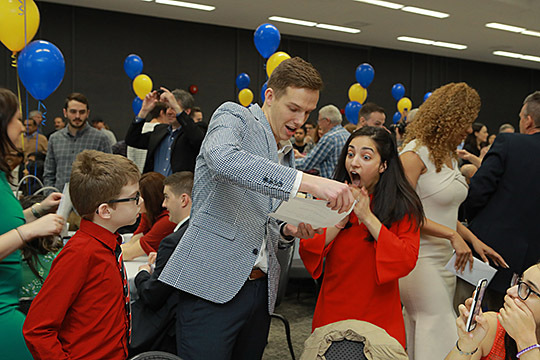 At precisely noon, UToledo College of Medicine and Life Sciences students will join thousands of students from other medical schools across the country in tearing open envelopes that contain their match. The 2019 Residency Match Reception will begin at 11 a.m. at the Stranahan Theater’s Great Hall. The event is by invitation-only. Medical students spend months interviewing with hospitals and universities across the country to determine where they want to spend the next three to seven years of their medical training. Students rank their top institutions, and academic and community-based health systems rank their top student choices. A computer algorithm administered by the National Resident Matching Program then matches students and residency programs together. Residents are licensed physicians who care for patients under the supervision of attending physicians while they continue to train in their chosen specialties. Last year, 157 UToledo fourth-year medical students matched into positions in 23 medical specialties. 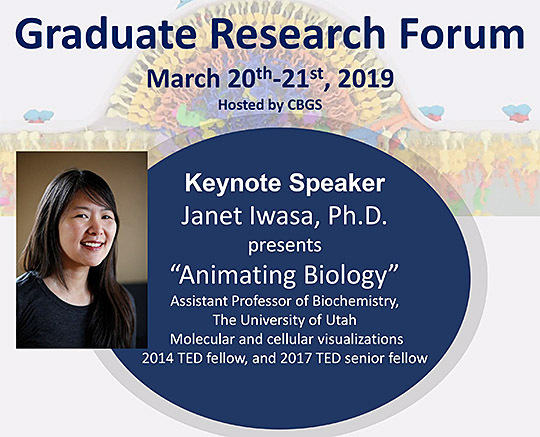 Dr. Janet Iwasa, award-winning artist, will be the keynote speaker at this year’s Graduate Research Forum. She will discuss “Animated Biology” Thursday, March 21, at 3 p.m. in Collier Building Room 1000A/B. Iwasa is an assistant professor of biochemistry at the University of Utah and is known for her molecular and cellular visualizations. Her illustrations and animations have appeared in scientific journals including Nature, and Science and Cell, as well as in The New York Times. She is also a 2014 TED Fellow and 2017 TED Senior Fellow. The event will begin at the Mulford Library Café Wednesday, March 20. Poster presentations will take place from 10 a.m. to noon, then there will be lunch from noon to 1 p.m., with oral presentations taking place from 1 to 4 p.m. Final presentations will take place Thursday, March 21, from 9:30 to 11:45 a.m. in the Mulford Café, followed by lunch with Iwasa from noon to 1 p.m.
Those who wish to have lunch with Iwasa are asked to RSVP to councilgraduatestudents@utoledo.edu by Friday, March 15. 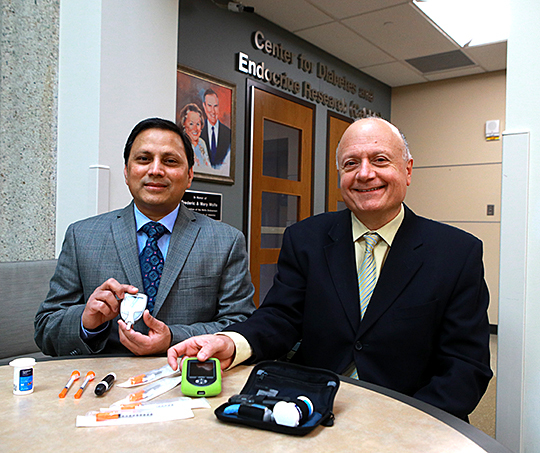 Dr. Shahnawaz Imam, left, and Dr. Juan Jaume display an array of diabetes management tools that patients rely on to control their disease. 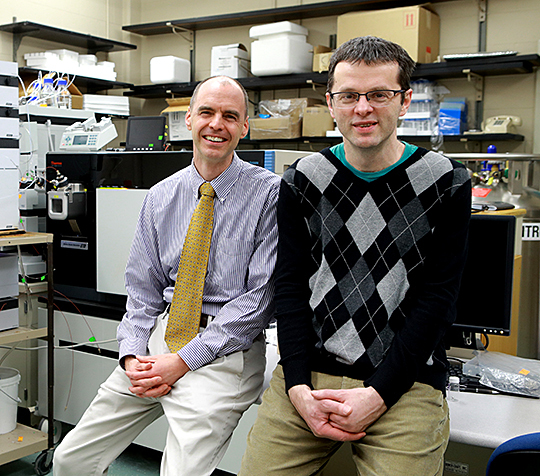 A new mouse model developed at UT may open the door to research that finds new therapies. 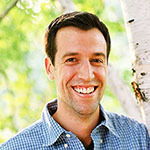 In that study, Jaume, who is also chief of the Division of Endocrinology and director of UT’s Center for Diabetes and Endocrine Research, and co-collaborator Dr. Shahnawaz Imam, a senior researcher in the Department of Medicine and an associate member of the Center for Diabetes and Endocrine Research, looked at how a certain protein can influence T-cells in the pancreas to delay the onset of diabetes. Using the same idea behind CAR T-cell therapy for cancer, in which certain immune system cells are taken from a patient and paired with an artificial receptor that once reintroduced into the body homes in on the tumor, the team is developing cellular therapies for diabetes that use the mice’s regulatory cells to cool down the immune response. The University also has filed a provisional patent on the treatment method, and Jaume and Imam soon will begin a more in-depth study of its effectiveness.